A Record of the Progress of the Science and Ethics of Spiritualism / The Oldest Newspaper connected with Spiritualism in Great Britain. Corporate author: Organ of the British National Association of Spiritualists (1874-79), until Harrison broke with William Stainton Moses. 1/1 November 19, 1869-20/4, January 27, 1882. 10s, 10d. 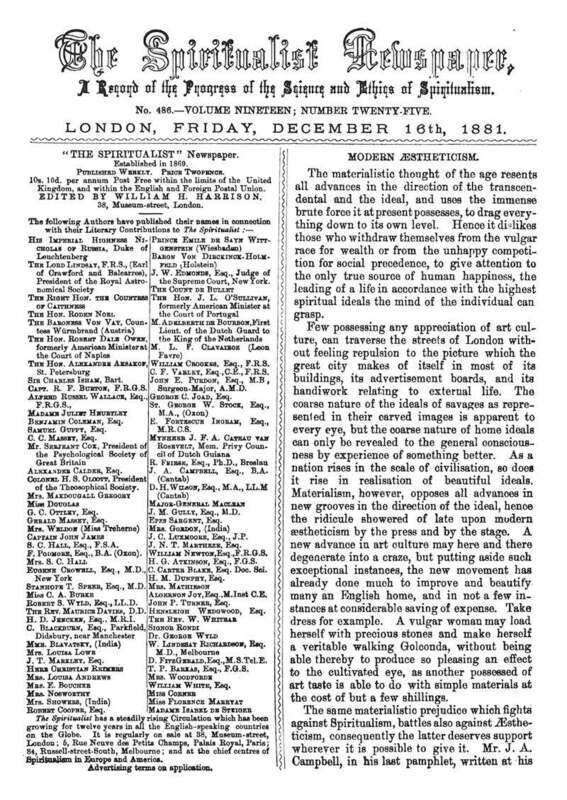 The leading British spiritualist periodical of the era, filled with "scientific" and somewhat skeptical (for the genre) investigations of and comments on the phenomena of the time. From 1874 to 1879 it was the organ of the British National Association of Spiritualists, but lost the position when its editor quarreled with William Stainton Moses and the BNAS took its patronage to Spiritual Notes. Contributions from practically everyone in England (and America) who was interested in spiritualism, including C.F. Varley, William Crookes, Alfred R. Wallace, Emil de Sayn Wittgenstein, Robert Dale Owen, John L. O'Sullivan, C.C. Massey, Alexander Calder, Mrs. Makdougall Gregory; Alexander Aksakov; Adelma von Vay; C. Carter Blake; Emily Kislingbury; Anna Blackwell, et al. Edward W. Allen, who was involved with this and also published Spiritual Notes and The Spiritual Record, was a member of the New Church (Swedenborgian) and published one of its journals, The Dawn. LOC; Harvard University; National Library of Scotland; University of Manchester; ZDB: Freiburg Inst Grenzgeb Psychol.